Of the 40 bottles produced, Sir Peter Blake – the pop artist famed for designing the Sgt Pepper’s Lonely Hearts Club Band cover for The Beatles – and Italian graphic artist Valerio Adami designed the labels for 12 bottles each. These were originally offered as corporate gifts to Macallan’s most valued customers, but have since become some of the most sought-after bottles by whisky collectors. ‘These represent some of the most exclusive bottles ever produced, making this an iconic sale that will be remembered worldwide for years to come,’ said Geoff Kirk, Macallan’s director of prestige. Le Clos said that each of the two bottles had originally sold for £20,000, with the last known individual bottle sold at auction by Christie’s in 2007 for US$75,000. 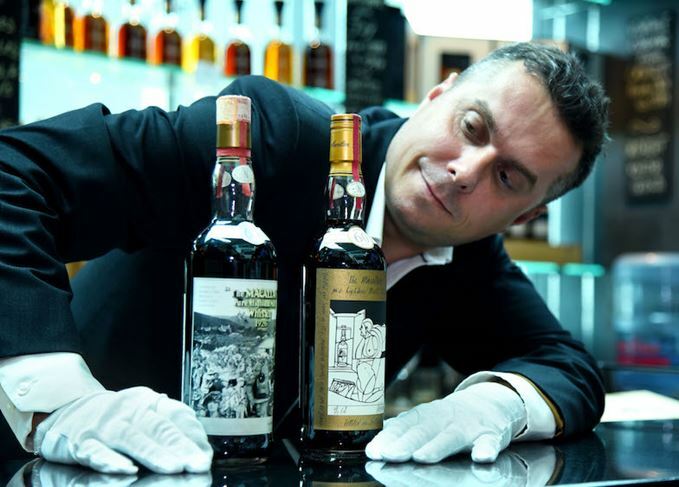 The world record price for a single bottle of whisky remains the $628,000 paid for The Macallan M Impériale at Sotheby’s in Hong Kong in 2014; however, an Impériale holds six litres, or the equivalent of just over eight-and-a-half 70cl bottles. But the sale by Le Clos may not hold onto its record-breaking status for long: it comes a few weeks before two more of the Blake and Adami bottles are due to be auctioned by Bonhams in Hong Kong. The bottles each have pre-sale estimates of HK$3.6m-4.5m (US$460,000-573,000), but could well exceed those amounts.